Nothing is as evocative of "home" as the smell of Lemon Pledge. Like the scent of popcorn or bubblegum, the unique chemical tang of Pledge (or Old English if that was your family's go-to) immediately transports us to old-fashioned childhood Saturdays helping our parents clean and polish the various corners of the house we'd spent the previous week covering in grubby handprints. One Foundry Father loved Pledge so much he once Pledged the stairs to get them looking their super-shiny freshest. They were indeed beautiful. But so slippery that a Foundry Mama (complete with load of laundry) ended up over teakettle at the bottom, covered in socks. The unforeseen perils of Pledge (and its other industrial aerosol counterparts) don't end with spilled laundry: nefarious, undisclosed chemicals with unknown toxicities, aspirated from a single-use, plastic-heavy, ozone depleting spray tube, with unnecessary dyes and petroleum and silicon based ingredients that sit atop woodenware for a topical shine that does nothing to nurture the material underneath. Get us a soft rag so we may dry our tears. Now, now. Now, take that soft rag and use it to apply any one of these Christophe Pourny magical furniture-care tinctures instead. Born and raised in the Var region of Southern France, Christophe grew up rummaging around his parent's antique store (where we can only assume Pledge was anathema). 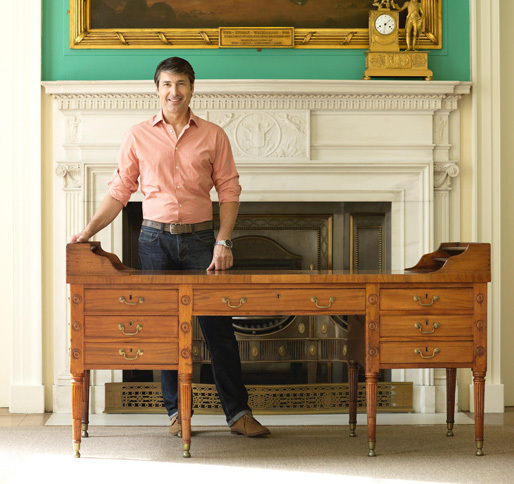 After apprenticing in his Uncle's furniture shop on the Rue Jacob in Paris, Christophe moved to New York in the 90's, where he launched his own furniture studio—caring for and restoring beautiful old pieces. 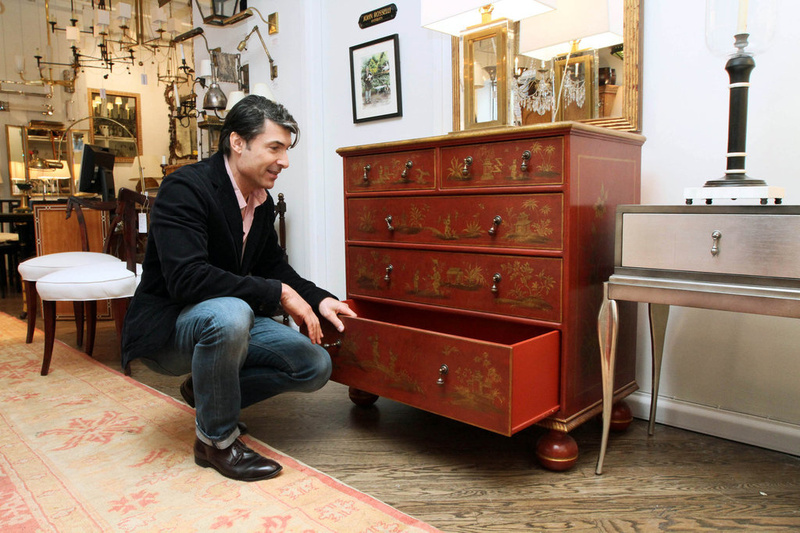 After a few decades of being asked repeatedly how to deal with water rings and cracked veneer, he created his own collection of tonics, creams, serums, and waxes, specially formulated to treat and prevent common furniture woes. 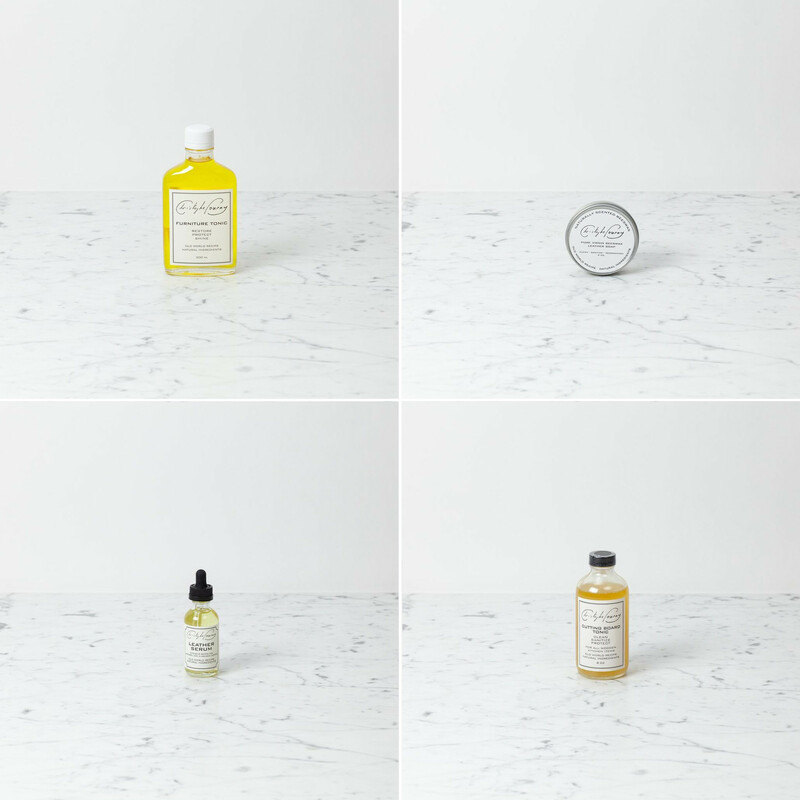 Made in Brooklyn, NY, in Christophe's studio, the all-natural, small-batch formulas are hand-mixed by furniture restoration artisans and experts and poured into glass or tin vessels. With no harmful chemicals or petroleum distillates, these are richly scented with the organic essences of their all-natural proprietary ingredients: rosemary and tea tree, linseed and walnut, beeswax and lavender. It ain't the Lemon Pledge we grew up with, but growing up means discovering new, better things (and then giving a bottle to your dad with free rein to apply to the stairs *IF* he so desires). Furniture tonic for light wood and dark wood. Mineral-oil free food-safe tonic for all kitchen woodenware. Leather serum, conditioner, and soap. Suggested reading for furniture + DIY devotees.